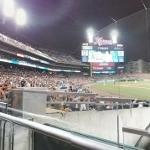 Comerica Park is a baseball stadium in Detroit, Michigan, and is home to the Detroit Tigers. Comerica Park replaced Tiger Stadium in 2000, and is named after Comerica Bank, which used to be based in Detroit. A significant architectural feature of the stadium is its iconic tiger sculptures.